The summer has nearly arrived! If you are thinking about an enhancement for your garden for the longer and warmer days of summer then leading landscapers in Dublin, landscaping.ie will be able to provide you with an innovative garden design make over. With a full range of end to end landscaping services and after care support you can be guaranteed to spend the summer surrounded by a fresh and imaginative garden design. A new garden design can enhance your property. You can enjoy your garden space with the addition of paths, garden furniture and elegant plants. With the addition of outdoor garden lighting, which our landscapers can install, your garden will come alive at night with spectacular lighting highlighting the new design. 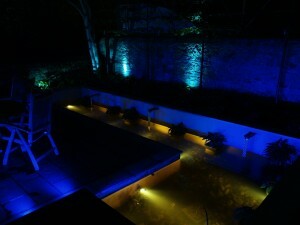 You can see an example of our outdoor garden lighting below. The range of services that our landscapers provide include a mock-up design of the garden, installation of lawns, fencing and paths, garden lighting and water features. All the services work together to provide the end result design. In the image below you can see how the water feature is integrated into the garden design. 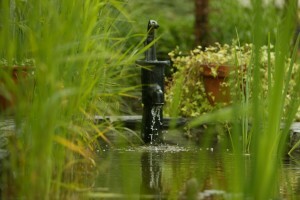 The water feature adds additional harmony and elegance to any garden design. It can make your garden a tranquil place. 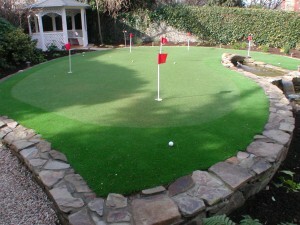 Other features that our expert landscapers can provide are golf putting greens. If golf is one of your hobbies then it would be very convenient to have a putting green in your back garden. You would’t have to travel far to precise your hole in one! In the image you can see how the putting green has been integrated into the overall design.